New Zealand's Alien Weaponry Mix Maori Culture And Heavy Metal The members of Alien Weaponry aim to preserve their indigenous language through a unique medium: thrash metal music. The New Zealand trio is billed as the first Maori metal band. The prize-winning trio mix their Maori culture with heavy metal. Brothers and bandmates Henry and Lewis de Jong, 17 and 15 respectively, were brought up on two things: Māori culture and metal music. The two New Zealand natives fully embraced their heritage at a young age. They attended a Māori immersion primary school — known as a Kura Kaupapa — where they learned to speak fluent Te Reo Māori, the language of the country's indigenous population. Meanwhile at home, the boys were also being brought up on metal music. Their father-turned-band manager, Niel, used to quiz them on the music of Metallica, Rage Against the Machine, Lamb of God and Pantera. So when the brothers formed Alien Weaponry in 2010, mixing Māori with metal is just what they decided to do. Along with bassist Ethan Trembath, 15, who joined the band two years later, they're attracting a lot of attention for their songs addressing Māori issues sung in full Te Reo Māori. The video for their single "Rū Ana Te Whenua" (which translates to "The Trembling Earth") is sung in Te Reo and is reminiscent of haka, a traditional war dance of the Māori people. "The music really goes with that kind of aggressive style of vocal delivery," drummer Henry de Jong says via Skype from the band's hometown of Waipu, New Zealand. "And so for us to be singing in Māori and doing it in this kind of haka style, I think it works really well." "Rū Ana Te Whenua" tells the story of a fierce battle between Māori and British soldiers. The de Jongs are direct descendants of a Māori warrior who died during the battle. Topics like colonization and the suppression of Māori rights come up often in Alien Weaponry's music. The title of their single "Raupatu" literally means land confiscation. "It's a very common thing with metal to actually voice your opinions on politics, on unjust actions and kind of slightly controversial topics," de Jong says. At first, the guys were afraid of how people would take the Maori mixed with metal, but they say the response on social media and at their concerts have been mostly positive. They've also won the Maioha Award for exceptional songwriting featuring Te Reo Māori in September and have played in various music festivals around New Zealand. 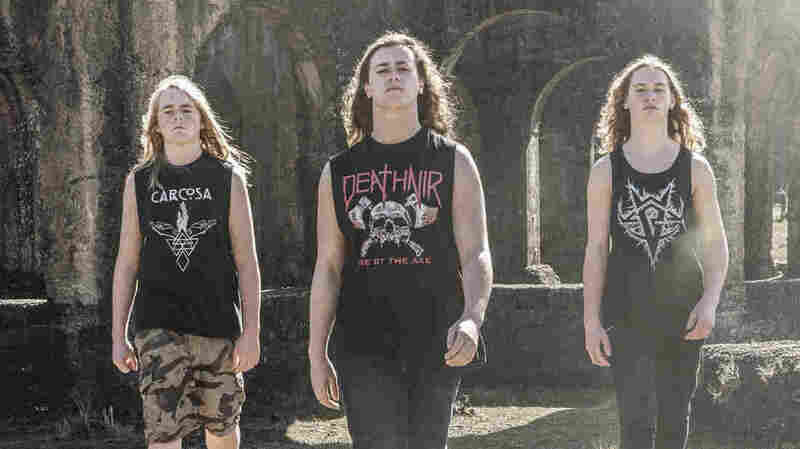 Music.net.nz music reviewer Alex Moulton believes Alien Weaponry is a standout band in New Zealand's small yet loyal metal community. The band is definitely original, he says. "If you watch their music videos on YouTube, if you don't understand the language you're not going to have any idea what they're singing about unless you put the closed captions on," says Moulton. "A lot of the other bands will use [Māori lyrics], but sort of like a special part of the song, whereas the rest of the lyrics are all in English." Te Reo Māori is considered an endangered language by the United Nations, which estimates that every two weeks a language dies somewhere in the world. Since the 1800s Te Reo Māori has been in a sharp decline, says Tania Ka'ai. She's a professor of language revitalization at the National Māori Language Institution at the Auckland University of Technology. "The language has undertaken a very harsh environment to survive, largely due to the impact of colonization," she says. In the 1980's, Ka'ai says a Māori cultural revolution happened and New Zealand saw a revitalization of Māori language, music and culture. It was during this time that the Māori immersion schools, just like the one the de Jong brothers attended, came into being. The language began to claw its way back, thanks to a shift in attitudes across New Zealand by non-indigenous people, says Ka'ai. "The language is used in the modern day in the home, in the community, in traditional Māori spaces. But also between people having a cup of coffee," says Ka'ai. Today, there are some Māori language television channels and radio stations across the country. Much of New Zealand's tourism industry depends on the Māori culture. Further, the New Zealand government has taken many steps to promote Te Reo Māori, even in the schools. Yet there's still work to be done, says Ka'ai. The latest census data, published in 2013, shows that only 21 percent of Māori even speak the language. That's down from 25 percent in 2001. The Māori make up about 15 percent of New Zealand's population. Ka'ai says it's important to keep pushing. "Because we can then shape our future, we can have control over our destiny," she says. "And we can navigate those important pathways that keep us whole. That's how we can survive as minority." Alien Weaponry is doing its part to keep the language alive. This means finishing a debut album, which the band aims to put out early next year. "[We] give young people kind of this inspiration to actually learn the language and keep it going," Henry de Jong says.